Atheist—God does not exist. Therefore disasters in this earth are just forces of nature. Agnostic—This person who claims neither faith nor disbelief in God will indicate that the supernatural had nothing to do with this tragedy. Polytheist—Many gods, but one of the gods was involved in this disaster. Scientology—Disaster, evil, and sin are not realities, but illusions. Unitarianism (One who asserts the unity of God, but rejects the trinity). Of course there are some things that are mysterious, but I am afraid saying that “all” calamities are a complete mystery is the wrong answer. God has given us answers. He knows we are beings with a intellect and a conscience. We need to be nuanced when explaining this. Why? 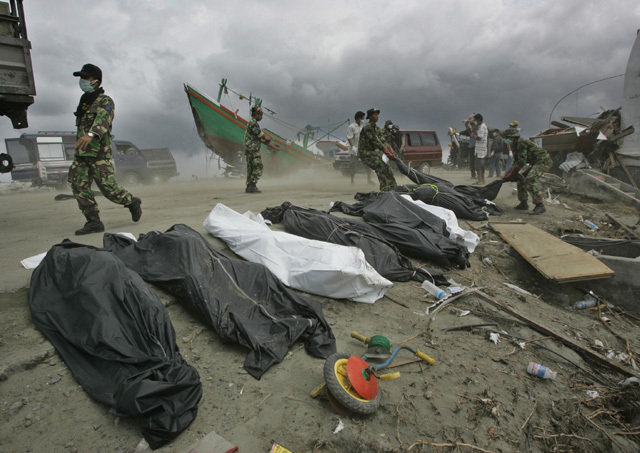 For example, after the tsunami, much evil occurred. Some sold their children for money. The disaster created a breeding ground for religious unity. Buddhist monk, Hindu priest, and professing Christians were singing songs of praise together. The world loves to see this. This is an appeal to selfish human thinking in the name of co-existence. You have probably seen some of those bumper stickers too. People saw religious unity as being good and virtuous. I have no doubt at all, that there is some good that comes out from natural disasters, but there is still a problem because those who think they are doing good are saying what God did is bad. They think they are morally good people in their behavior. That is wrong thinking. We need to see it from God’s standards. Please see Romans 3:23. Every person is a transgressor before God. There are no exceptions. This camp believes in God, but believes He is not involved. This is the opposite of theism. Theism believes God supernaturally interferes due to His providence. God does not know everything about the future. Psalm 135:6-7, “Whatever the Lord pleases, he does, in heaven and on earth, in the seas and all deeps. 7He it is who makes the clouds rise at the end of the earth, who makes lightnings for the rain and brings forth the wind from his storehouses. Isaiah 45:7, “I form light and create darkness, I make well-being and create calamity, I am the Lord, who does all these things. God is not surprised by natural disasters. He is sovereign. Even if Satan had an involvement in some natural disaster like he did with Job—Satan acted with God’s permission and under His sovereign rule. Nothing happens apart from God’s will. Question: What does it mean that, “None can stay God’s hand?” ANSWER: Nothing can stop Him from doing what He wants or wills. Moreover, even that question alone reveals something unsettling about man. Beneath the tone of that question in Daniel 4:35, man accuses God of doing something wrong. Stay tuned for the second part of this series as I plan on covering the big WHY question. Thank EZ. I’m looking forward to the rest of it. One thIng: the translation of Isaiah 45:7 – (I create) “calamity” (NIV, I think) gives the impression that this refers only to natural disasters. The Hebrew word is “ra” – evil. God decrees all evil including human evil. As we in the Reformed tradition understand, this does not mean that human beings are off the hook. Examples, Joseph sold into slavery, the crucifixion, the Assyrian and Babylonian destruction of the Jews, the Nazi Holocaust. And the shooting down of the plane over Ukraine! (where I think you will possibly be heading in your later posts). Thanks brother. Are you from Cambodia?